ISLAMABAD (92 News) – UN Secretary General’s ‘Special Advocate for Inclusive Finance for Development’, Queen Máxima of the Netherlands, has arrived in Islamabad on a three-day visit on Tuesday. 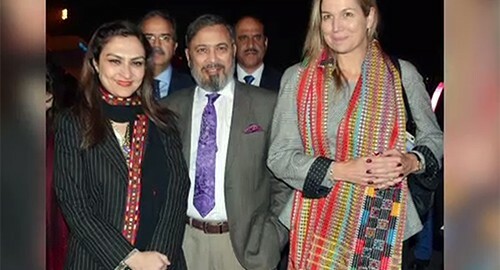 The Netherlands Queen Máxima was welcomed by Pakistan Muslim League-Nawaz’s Marvi Memon at the airport. During her three day stay in Pakistan, Queen Máxima will hold meetings with President Mamnoon Hussain and Prime Minister Nawaz Sharif, while she will also address other forums to raise awareness, encourage leadership and foster action towards financial inclusion. Prime Minister Nawaz Sharif had held a meeting with UN Secretary General’s Special Advocate on the sidelines of World Economic Forum in January.